Minnesota Heritage House, of Kimball, Presented with MBFC’s VetLoan Advantage Rebate! Minnesota Business Finance corporation (MBFC) is honored to present Jim and Kathy Birchem of Minnesota Heritage House in Kimball, MN, MBFC’s VetLoan Advantage rebate check for $3,000. MBFC is the only Certified Development Company in Minnesota to offer a rebate to business owners that are active or retired members of military service. Owner, Jim Birchem, served in the United States Army from 1972-1974. He was also active in the National Guard from 1983-2007 and retired as a Sergeant Major. 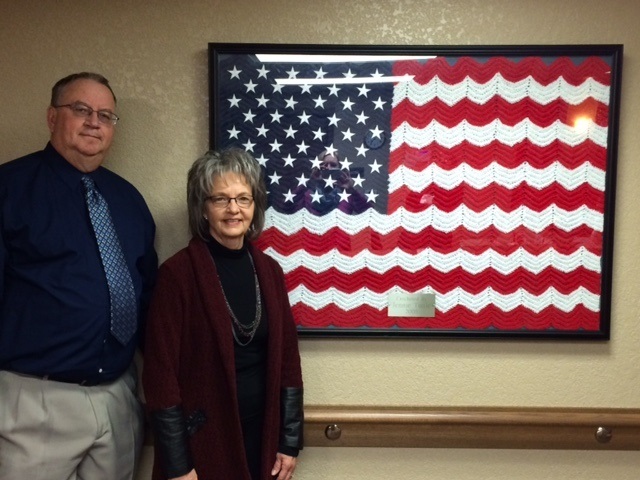 The U.S. flag Jim and Kathy are standing next to is a treasured afghan created by Kathy’s late Aunt, Jennie Tuttle. Kathy’s Aunt created one of these for each of Jim and Kathy’s facilities, 18 in all! With the help of Minnesota Business Finance utilizing the SBA 504 Loan Program in partnership with Granite Community Bank of Cold Spring, Jim and his wife Kathy purchased an adjacent parcel to their existing 18-unit assisted living facility in Kimball, MN and added the newly constructed 16-unit assisted living addition. Jim and Kathy, inspired by their Christian values and beliefs, believe in providing options in health care that will enable seniors to remain in their local communities. Jim and Kathy were happy to take advantage of the 20 year fixed rate and the reduced down payment requirement that MBFC could offer with the SBA 504 Loan Program. At MBFC, we believe in supporting veterans and improving our communities by providing more affordable funding for both existing and start-up businesses. MBFC’s VetLoan Advantage Program compliments the Small Business Administration’s (SBA) veteran loan strategic initiatives! For more information about Heritage House click here!